55 w w w . M o d e r n T i r e D e a l e r . c o m T i r e P r e s s u r e T ire pressure monitoring and in- flation systems are accepted as a proven way for fleets — either themselves or with the help of commercial tire dealers — to manage one of their biggest consumable items and better ensure safe operation on public roadways. ese systems continue to evolve, adding capabilities and functions that increase their effectiveness. 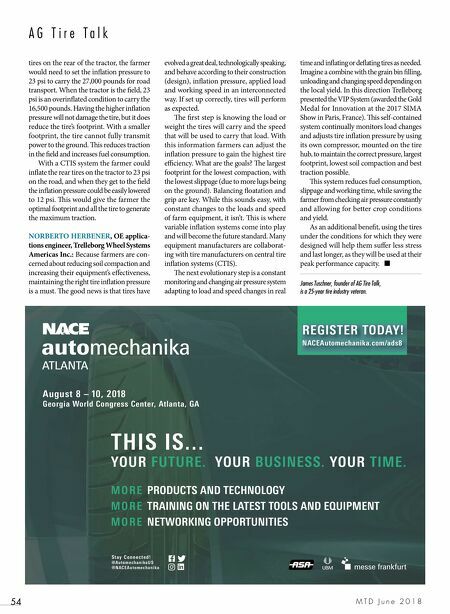 Vanessa Hargrave, chief operating officer for Advantage PressurePro LLC, notes that tire pressure monitoring is not new and has been on a steady path of improvement since it appeared over two decades ago. 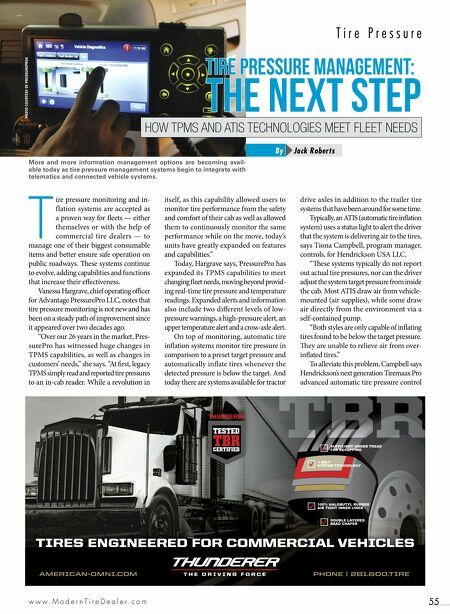 "Over our 26 years in the market, Pres- surePro has witnessed huge changes in TPMS capabilities, as well as changes in customers' needs," she says. "At first, legacy TPMS simply read and reported tire pressures to an in-cab reader. While a revolution in itself, as this capability allowed users to monitor tire performance from the safety and comfort of their cab as well as allowed them to continuously monitor the same performance while on the move, today's units have greatly expanded on features and capabilities." Today, Hargrave says, PressurePro has expanded its TPMS capabilities to meet changing fleet needs, moving beyond provid- ing real-time tire pressure and temperature readings. Expanded alerts and information also include two different levels of low- pressure warnings, a high-pressure alert, an upper temperature alert and a cross-axle alert. On top of monitoring, automatic tire inflation systems monitor tire pressure in comparison to a preset target pressure and automatically inflate tires whenever the detected pressure is below the target. And today there are systems available for tractor drive axles in addition to the trailer tire systems that have been around for some time. Typically, an ATIS (automatic tire inflation system) uses a status light to alert the driver that the system is delivering air to the tires, says Tiona Campbell, program manager, controls, for Hendrickson USA LLC. "ese systems typically do not report out actual tire pressures, nor can the driver adjust the system target pressure from inside the cab. Most ATIS draw air from vehicle- mounted (air supplies), while some draw air directly from the environment via a self-contained pump. "Both styles are only capable of inflating tires found to be below the target pressure. ey are unable to relieve air from over- inflated tires." To alleviate this problem, Campbell says Hendrickson's next generation Tiremaax Pro advanced automatic tire pressure control Jack Roberts By DOUBLE LAYERED BEAD CHAFER 4 BELT SYSTEM TECHNOLOGY SUFFICIENT UNDER TREAD FOR RECAPPING 100% HALOBUTYL RUBBER AIR TIGHT INNER LINER TBR TBR TBR TBR TBR TIRES ENGINEERED FOR COMMERCIAL VEHICLES AMERICAN-OMNI.COM PHONE | 281.600.TIRE Tire pressure management: The next step HOW TPMS AND ATIS TECHNOLOGIES MEET FLEET NEEDS PHOTO COURTESY OF PRESSUREPROA More and more information management options are becoming avail- able today as tire pressure management systems begin to integrate with telematics and connected vehicle systems.